the SPORE Project is a worldwide effort developed to promote awareness for the support for art education and creativity in day-to-day life. the project illustrates the importance of self expression, resourcefulness and creativity – specifically, how to look at one thing (a simple paper bag) and see what it can be instead of merely what it is. the project was created to build awareness, specifically to let people know the importance of art. art is essential: it promotes intelligence and creativity, and it’s a great expressive outlet that inspires people toward new perspectives on life, which we all need and need frequently. creativity is needed in every aspect of life. it teaches us to think differently and allows us to consider other options. the idea behind the paper bag mushroom grew innocently out of lunch in high school. while sitting around waiting for the meal break to end, i squished my lunch bag into a mushroom and gave it to my friend. this became a daily routine. years later i figured out a way to stick them in the ground. i then began placing them in my friends’ lawns while they were at work. 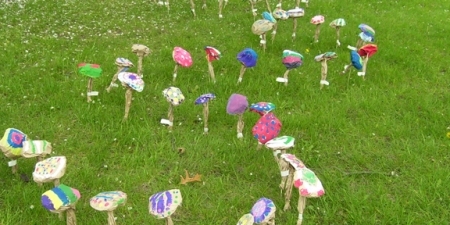 it was meant as a joke, but other people loved them and asked me to cover their yards with mushrooms as well. i began making hundreds, then thousands. i did them for festivals, art shows, parties and just for fun. i began getting calls from teachers asking if i could come show their classrooms the art of making paper bag mushrooms. even companies and corporations began to get involved. this is where the SPORE Project began. i developed the SPORE Project to build awareness, specifically to let people know the importance of creativity. creativity is essential: it promotes intelligence and growth, and it’s a great expressive outlet that inspires people toward new perspectives on life, which we all need and need frequently. You are currently browsing the archives for the z3 spore category.